Are you concerned about the risks of bear markets and the wreck it could have on your retirement account? Looking for ways to diversify your portfolio to reduce the risks of losing your nest egg? Well, let me introduce you to Treasury ETFs and Bonds. U.S. Treasuries, treasury ETFs and bonds are known as "safe havens" which provide investors protection during bear markets. Well, these asset classes are not a one-size fit all investment strategy. At the end of the day, each asset class is unique and all of them offer a different level of risk and potential levels of returns. 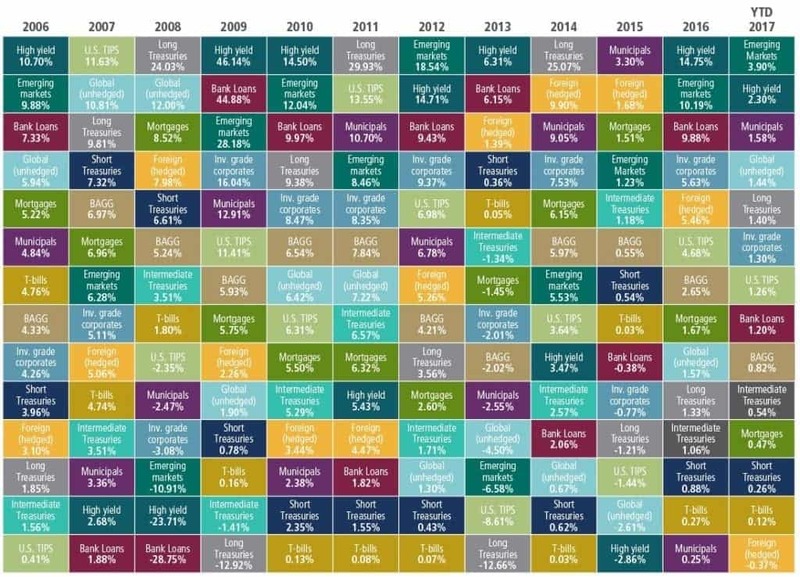 The quilt chart below, courtesy of PIMCO gives a quick glimpse into the different types of sectors one can invest in with bonds and you can also see how the returns vary depending on the sector. Do you want to use treasuries to hedge against a bear market or are you looking for steady income? Your answers to these questions will determine your investment strategy. Now that we have introduced the topic of treasuries and bonds, let's go a little deeper. Are Bonds and Treasuries Riskier than Stocks? What are Treasuries and Bonds? Why Invest in Bonds or Treasuries at all? 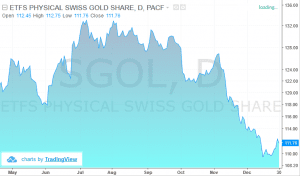 How can Treasuries help You Offset Losses from a Bear Market? Is Buying Treasury ETFs the same as Buying Treasuries? What are some of the most popular Treasury ETFs? Bonds and treasuries come with a promise from the issuer to return their face value after the term matures. What this means for investors is that if they buy $1,000 worth of T-Notes for a 10-year term, they can rest assure they will receive $1,000 at the end of ten years. During this 10-year period, treasury investors also get paid what is called a coupon rate which is the interest one gets for buying the bond or treasury. Of course, factoring inflation and other aspects, the returns are not stellar but you will not lose money. However, when investing in stocks, you assume full financial exposure for that position. No matter if you buy shares in one company or sprinkle money around, there is no guarantee you will recover your investment. But what you lose in risk exposure, you can expotentially make up in returns. Anyone can issue a bond; from sovereign nations to corporations and even local municipals. Although there is a saying that all bonds are risk free, the truth is that not all bonds or treasuries that you buy are risk free. Another important distinction to make here is the terminology. While bonds and treasuries can be used interchangeably, the term treasuries are applied only to the longer dated bonds and ones that are issued by the U.S. Department of Treasury only. Thus, while most bonds in general, such as sovereign, municipal and corporate bonds are at risk of a credit or an institutional default, the treasury bonds are not, as they are backed by the "full faith and credit" of the U.S. government. This risk, known as the default risk in bond market terminology, is the potential default from the issuer. Based on this default risk, the markets price the bond yields (and prices) accordingly. The 10-year yield on the Greek bonds shown below is one such example where the yields rallied to a whopping 36% in the height of the Greek debt crisis which put the country at risk of a default on its bonds. The safe haven doesn't look so safe now. Of course the Greek debt crisis is a once in a generation occurrence, but an event like this is possible. As stated earlier, since Treasuries are backed by the full faith and credit of the U.S. government, the returns one can expect from these assets are small. Thus, a common question from investors is why bother buying treasuries with such a small projected yield. The obvious answer is you need to balance your portfolio. Any respectable financial advisor will tell you that you should not be heavily weighted in any one investment type. Now the amount of money you place in Treasuries will depend on your target return for the year. But let's say you have 20% of your portfolio in Treasuries and there is a major bear market correction of 20% or more. In this scenario, the exposure to Treasuries which otherwise would under perform the market will now have you looking like a hedge fund master. Because bonds are "safe haven" assets, investors tend to sell bonds and invest their money in the stock markets with hopes of making a greater return. Therefore, when bonds or treasuries are sold, prices fall making yields more attractive. Similarly, when equities are in a bear market, investors tend to sell stocks and purchase bonds and treasuries. In this scenario, as demand for treasuries or bonds increase - yields fall. Hence, when stocks rally - bond prices fall and when stocks are in a bear market - bonds and treasuries rise. No. Treasury ETFs track an index of bonds and replicates their performance. Treasury ETFs also provide the flexibility to trade on a stock exchange similar to if you were trading equities. One of the biggest differentials between treasuries and treasury ETFs is that the ETFs do not expire. This constant maturity is based on the weighted average of all the maturities of the bonds the treasury ETF tracks. At any point in time, a treasury ETF will have bonds or treasuries that are expiring or reaching maturity. Therefore, treasury ETFs constantly rebalance by purchasing new bonds or treasuries. While treasury ETFs might be a good way to offset the market decline, they also come with the additional benefit of receiving payment on a fixed income. In most cases, treasury ETFs pay fixed monthly income based on the bonds and treasuries they track. Treasury ETFs give traders the convenience of price discovery, liquidity and the additional advantage of paying fixed income. While Treasury or bond ETFs has some strong advantages, there are some factors to keep in mind as well. Unlike buying treasuries directly where the face value is guaranteed, with Treasury ETFs this is not the case. In other words, when you buy Treasury ETFs there is no guarantee that you will get back your investment amount. Last but not the least, while Treasury ETFs might be a good bet against falling markets, they do suffer under higher interest rates which can pull down the value of bonds. Despite their shortcomings, Treasury ETFs are a good way for investors to build a diversified portfolio that can easily protect their investments against uncertain market conditions. While buying bonds and treasuries outright is a good investment in itself, as far as stock market investors as concerned, Treasury ETFs are a great place to start hedging the risks. Among the different Treasury ETFs here are the top three, based on factors such as assets under management (AUM) and expense ratios. The iShares, 3-7 Year Treasury Bond ETF, (SHY) focuses on short-term Treasuries and has an expense ratio of 0.15% with total assets under management of $11.044 million. Among the different types of treasury ETFs, the SHY is the most popular due to the short term maturity curve. The SHY focuses on treasury with less than three years to maturity and therefore offers a balanced risk between interest rate risk and credit risk. The iShares 3-7 Year Treasury Bond ETF, IEI has an expense ratio of 0.15% with assets under management of $6.650 million. The IEI ETF allows investors exposure to the three - seven year maturing Treasuries with little risk of interest rate hike. The IEI also delivers higher returns and overall offers a good cost perspective for investors. The iShares 20+ Year Treasury Bond ETF, TLT has an expense ratio of 0.15% with over $6.313 million assets under management. TLT is ideal for investors who want exposure to the longer date Treasuries. Do not look to treasuries or bonds as a method to create double-digit returns for your portfolio. Think of them as the slow and steady income stream in your portfolio impervious to market swings. Remember, it does not take a big shot to invest in treasuries or bonds. All you need is access to a brokerage firm where you have access to dozens of ETFs.